Exchange for Change teaches writing in prisons and runs letter exchanges between incarcerated students and writers studying on the outside. By preparing prisoners for their reentry into the outside community and preparing that community for their return, Exchange for Change provides vision and understanding on both sides of the fence. Exchange for Change believes in the power of written partnership to promote dialogue and effect social change. We facilitate anonymous writing exchanges between students in correctional and transitional facilities and students attending high schools and universities. This video features voices from both sides of the razor wire fence. Executive Director Kathie Klarreich conducting an exchange with inmates. A large audience of outside guests and inmates gathers around the "stage" at one of the 2016 spring Exchange for Change graduation ceremonies. A graduating Exchange for Change student performing his work at the spring 2016 DCI graduation. Exchange for Change Facilitator Benjamin Bogart teaching his new rhetoric class over the summer of 2016. Exchange for Change Facilitator Henry Unger teaching his new journalism class over the summer of 2016. All students are required to start with an Exchange for Change Writing Course. Exchange for Change facilitators cover the basic principles of writing through reading and writing exercises, texts, and prompts. Students are introduced to fiction, creative nonfiction, and poetry, as well as craft techniques. Students receive one-on-one feedback and at the completion of the course, a certificate. Classes run from eight to 16 weeks for 60, 90 or 120 minutes, depending on the institution. Class size varies from six to 20. 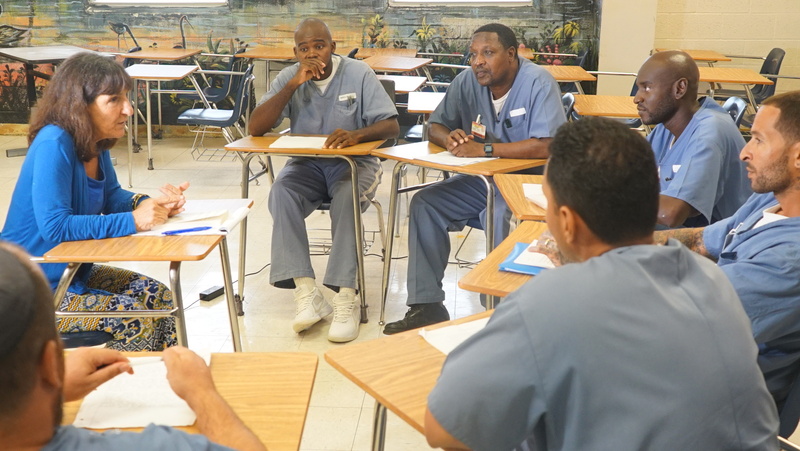 The Exchange classes pair a correctional institution with an academic institution. Both the 'inside' and the 'outside' students receive the same prompts and/or texts. Every student responds to the prompts and texts, and then, using a pseudonym, exchanges papers with an assigned partner through a system set up by each students corresponding teacher. These exchanges run weekly for the length of the academic semester of the outside partner (usually 12-14 weeks). The two-hour weekly courses inside the prison accommodate up to 18 students. All correspondence is carefully screened to ensure no personal information is shared. Outside exchange students develop empathy and learn to see their partners as more than the crime they committed, while inside students have the opportunity to forge new identities and engage in intellectual dialog. Certificates are awarded to students who complete the course. Our Exchange partners include University of Miami, Florida Atlantic University, Ransom Everglades and Florida International University. Our inside students are housed at four correctional institutions and a juvenile facility all in Miami-Dade County. These courses focus primarily on one genre or craft. This flexible format ensures that the students are presented with a rotating curriculum and a variety of themes: short story, memoir, rhetoric, debate, journalism, writing on trauma, memoir, sketch humor writing, song writing, persuasive writing, graphic novel, civil rights and literature and creative writing in Spanish and spoken word poetry. These two-hour classes run from eight to 16 weeks and accommodate up to 20 students. Certificates are awarded to those who complete the course. In conjunction with the nonprofit O, Miami, these eight-week poetry workshops demystify poetry through innovative, hands-on classes that introduce students to classical as well as modern-day material. Students will read and study various forms of poetry at the same time they are exploring their own voice. The two-hour classes can accommodate up to 20 students. Certificates are awarded to those who complete the course. All Exchange for Change students may sign up for at least one 30-minute one-on-one tutoring session with a professor from the University of Miami's Writing Center (provided that the tutors are serving their institution). This free service, under-written by the University, offers students individual instruction focused on building particular skills, ranging from writing with clarity and correct grammar to crafting story structure and understanding the art of revision. This component of our program is of special value to our incarcerated students, who enter our classrooms with a diverse array of skills and talent and whose lives are often void of any direct positive reinforcement.